CBOT markets are higher after the solid close following the commodity run up after yesterday’s Fed rate hike. It was typical “sell the rumor, buy the fact” type of a reaction to what everyone seemed to know would happen. Silver, gold, crude, copper, soybeans and the feed grains all performed pretty well post meeting. I don’t think there is too much follow thru to be expected from that story but I expect modest short covering into the weekend. The dollar remains on the offer, which should be good for commodities prices, especially markets like wheat and cotton. 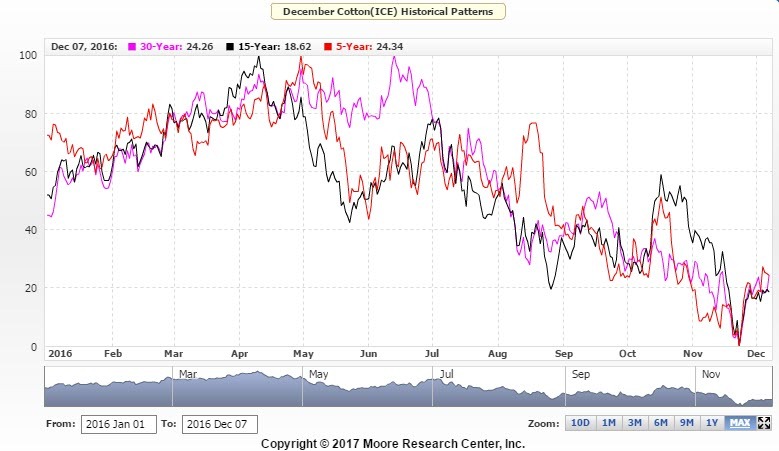 The market for cotton is looking more like the market for white gold as the bad news sees pause in rallies while the good news sees continuation of the trend, at least in the front month. The outlook for a planted acrege jump of at least 15% is keeping the Dec down against the old crop. China is continuing to offer bales up via auction, but the demand is slowing. Yesterday they sold ONLY 76% of what was offered. Last week when auctions started they were moving all of it. CHina continues to import announcing that in Jan-Feb they had brought in 67% more than a year ago. We expect this pace to slow in months ahead and the seasonal traders should try to get this market to put in a top over the next month. As you can see below, the 5 year seasonal tops in late April, the 15 year tops in early april while the 30 year tops later in the summer. Given the demand story, I think we probably see it track the 30 year seasonal and trade sideways through the planting (May-June). Could we see 80 on Dec 17 before the end of Q2? Sure, but as you know I am encouraging hedging of this market. I think the spec longs get tired eventually and begin to bail, but the story has not been bearish enough I guess. Prospective plantings at the end of the month may be that story. Standby…. In the rest of the row crop picture, I’ll be interested to hear from folks in the mid-south wheat areas about how their crops handled the freeze last night. My guy down in Kentucky said that it got down to 17 last night, they had a solid freeze and he was nervous about how the crop handled it. He thought worst case they could have lost 30-40% of potential yield. If you are not long wheat on the rec I put out (Buy July KC wheat below 460), its not too late. July Chi below 460 might be a good deal as well. The market will begin to care about wheat conditions when it realizes there is a problem, as of right now there is no realization. Short positions have grown in recent weeks. I think buying makes a lot of sense here. The forecast is wetter in KS, and drier in the Southeast next week as the models show rains for much of the drier parts of Kansas. A second system has been added as well, and the KC wheat market now waits on actual precip totals and coverage late next week. USDA exports were released this morning, corn numbers appeared to be fantastic while cotton came in at expectations. Soy exports came in near the bottom of export expectations and wheat exports below. We are seeing demand slowly leak away in beans, which combined with a weak crush from yesterday is not what bulls want to sell. Beans are on the longest losing streak from a front month contract (days with lower closes) since 2014. I expect a correction at some point. The market has now digested the USDA’s bearish March WASDE report and Southern American production hikes and we remain above recent support. with USDA planting intentions report just two weeks away and the end of Q1 approaching, its about whether or not the funds want to add positions.